Richard Broadbent has kindly supplied this months article. Something of a "spot the difference" feel about this one as Richard introduces Synodontis congica and discussed two other species of similar appearance. This Congo dwelling species is one of a trio of occasionally imported species which exhibit a few individual large round spots on their flanks: S. nummifer and S. notata being the other two. It is a smaller Synodontis species. Seegers quotes 20.2cm TL as the maximum attainable size but I have not seen one above 13cm, more usually they are seen in dealers tanks at 7-9cm. Although it is not fragile, it is certainly not as robust as a lot of other Synodontis and bottom dwelling companions should be chosen with careful consideration. Ideally, a tank with some smooth round stones and bogwood planted with anubias and a sand substrate is what is required, accompanied by some shoaling African tetras or smaller barbs. It is relatively unfussy as to water conditions and the food that is required, but owners should ensure there is minimal competition for food and there is a good variety of foodstuff offered. 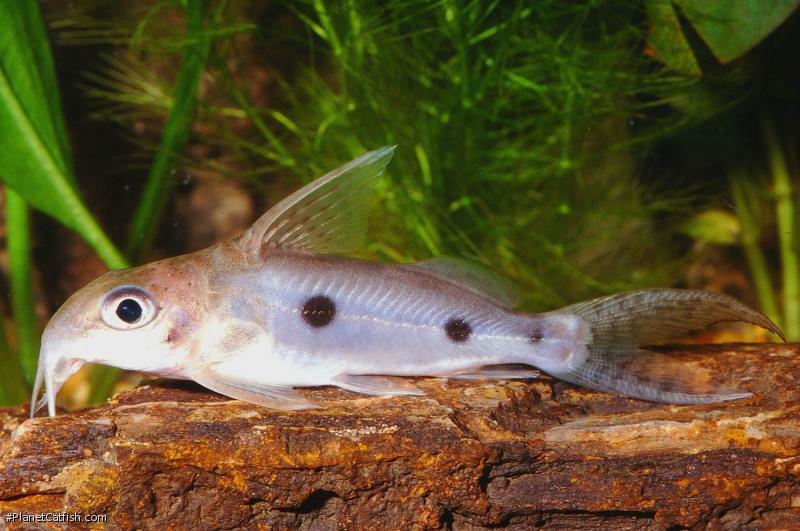 This species may, on occasion, take a while to fully settle down and appear a bit skittish upon introduction, although they do get on well in groups and thus should be kept this way and not as single specimens or as a lone individual in a tank of mixed Synodontis. While we are on the subject of other species, how is this species told apart from the other two? S. nummifer is probably easiest to identify from the three species. Whilst it is small it reasonably resembles S. decora, with clearly discernable patterning in the caudal and dorsal fins and large body blotches. As it moves towards adulthood the fin patterning fades ever-so slightly and the body blotches reduce to more clearly defined spots on a silvery body. This leaves us to try and differentiate between S. notata and S. congica. Actually it is not all that difficult as the two key features are the maxillary barbel length and snout shape. In S. notata the maxillary barbels are quite long and when swept back along the body, they reach to the end of the humeral process and this species has a pointed snout. In S. congica the snout is blunt with much shorter maxillary barbells, barely reaching back past the eye. The confusion arises because both fish are imported at small sizes and are similarly coloured: a silvery grey-brown with pale belly and have large distinct spots on the flanks. Often, S. notata has a single spot on each flank and additionally S. congica often has two spots on each flank but this is a poor identification process as some specimens of both species have no spots at all and others have differing numbers of spots each side. I remember back in the late 80’s, in a retailer in Birmingham, UK, seeing a large, chunky, foot long S. notata with seven spots on one side and six on the other, quite an extreme example. This is a very rewarding smaller Synodontis which at this time has not been bred in captivity although it would make great project for a dedicated hobbyist.